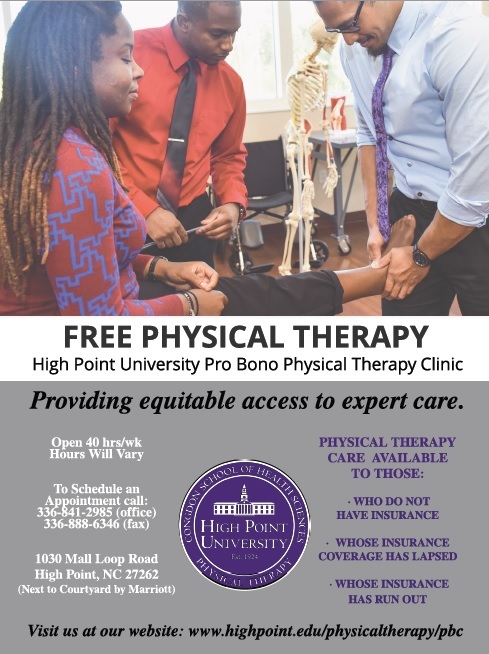 High Point University’s Department of Physical Therapy believes contributing to the health and wellness of the community is of the greatest importance. The Pro Bono Clinic is open 40 hours per week, generally providing care from 8:00am-5:00p to those who 1) do not have insurance, 2) whose insurance coverage has lapsed, 3) who insurance has run out. Our clinic strives to provide expert care as we guide patients to their greatest health improvements possible. Our mission does not include completing evaluations to determine ability to work. To improve the health and quality of life of the underserved in the City of High Point and surrounding areas by providing exceptional and free physical therapy services to people who are underserved, underinsured, and not insured, while simultaneously fostering student clinical experiences founded on the principles of community engagement, civic responsibility, and professional dedication. The High Point Physical Therapy pro bono clinic, a sustainable, collaborative, interdisciplinary clinic providing excellent compassionate care and education, is dedicated to empowering individuals to live with an improved quality of life, developing meaningful connections with the dynamic and diverse neighborhoods in the hope of promoting a healthier community. Dr. Naze works with patients with pain conditions in the Department of Physical Therapy’s Pro Bono Clinic. 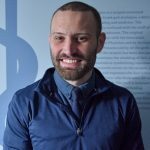 His clinical approach and research interests incorporate health and wellness measures, health behavior skills training, and motivational strategies to address multiple body systems in this patent population. His goal is to help build the Pro Bono clinic into an asset for the community and a resource for clinical training.